A nationwide survey of 2,800 teen drivers conducted by Liberty Mutual Insurance and SADD (Students Against Destructive Decisions) finds that teens become riskier drivers as they rise up the ranks. Despite only having been behind the wheel a year or two longer than their younger peers, older teen drivers perceive themselves as safer drivers. The study suggests older teens may be overly confident in their driving abilities, as 57% of high school seniors have experienced an accident or near miss compared to only 34% of sophomores. Older teen drivers tend to engage in riskier behaviors such as using their phone, having three or more passengers, and speeding. And often, older teens’ risky driving behaviors aren’t followed by a parental reprimand. The study suggests parents may be doing too little to dissuade their older teens from engaging in risky driving behaviors. Nearly 70 percent of younger teens (ages 15 and 16) said they would lose their driving privileges if they were to get into an accident, but only half (55 percent) of teens 18 and older believed they would experience the same consequence. "Older teens are still inexperienced drivers -- even if they feel otherwise -- as they only have one to two years of real-world practice under their belts,” said Mike Sample, lead driving safety expert at Liberty Mutual. “That's why it is important to continue to emphasize the effects and potential consequences of phone use while driving to this age group." 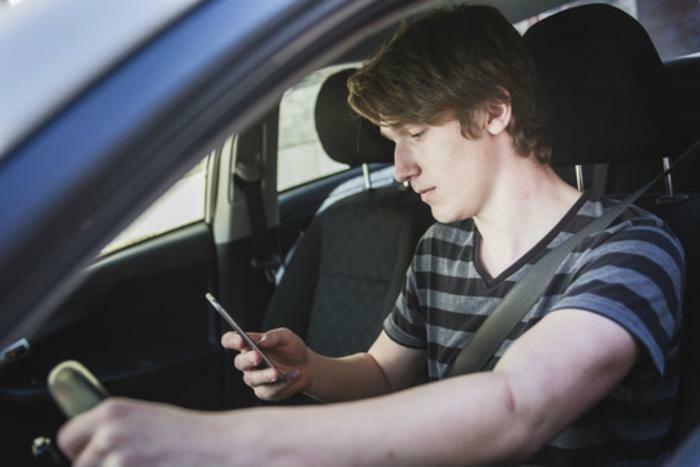 Teens are often tethered to their devices, but using an app behind the wheel -- even for just a second -- can “set off a chain reaction that could lead to a near miss or crash,” says Sample. He recommends reminding teens to always pull over before using their phone. “It’s just not worth the risk of crashing,” he says, adding that parents are key influencers when it comes to their kids’ behaviors behind the wheel. Parents should strive to continually encourage safe driving habits, even as teens get older and gain driving experience and confidence. Keep practicing. Driving practice shouldn’t stop once your child gets their license. Parents should continue to drive with their teens and remind them of safe driving behaviors, says Liberty Mutual. Hold each other accountable. Help set a good example for your teen by using driving behavior monitoring technology right along with them. The HighwayHero app can help to hold the whole family accountable for their driving behavior with its ability to track behind-the-wheel phone usage, hard braking, speeding, and other risky behaviors. Reward safe driving. Practice positive reinforcement of good driving habits rather than negative consequences for bad driving behavior. Parents can use rewards like a break from a specific chore or a $10 gift card to remind teens to think about their actions while driving. Set expectations. Create a Teen Driving Contract to help teens stick to family driving rules.